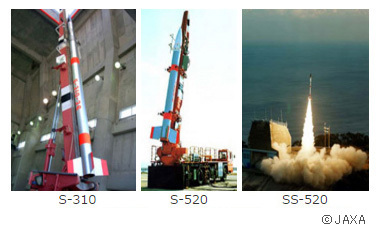 Sounding Rocket｜Space Development｜Products｜IHI AEROSPACE Co., Ltd. The S-type sounding rockets include S-310, S-520, and SS-520 which are used for scientific observations and various experiments at altitudes of up to 190 km, 350 km and 1000 km respectively. The S-310 and S-520 rockets are used for ultra-high altitude atmospheric observations and various recovery experiments and the SS-520 rocket is used for observations of the magnetosphere over Spitsbergen, Norway. International Space Station Japanese Experiment Module "Kibo"
All rights reserved, Copyright © IHI AEROSPACE Co., Ltd.